Take hold of Death’s Own Razor! The classic straight razor gets a chilling twist with this piece, depicting an etched image of Azrael, the Angel of Death. Made for Tomahawk from China (of course). The hilt is chemical etched, plain steel through out, nothing fancy but the etching which is artful. Surprising even though the blade is made of stainless steal and very thick it passed my arm shave test so it was sharp enough to try a shave with it. The rivets in the hilt was peaned over and ground down so overall it gives this razor a rough an tough appearance. Since my son is a biker I ordered two, one for him and one for me to hang on the wall with the other novelty razors great BOGO deal. 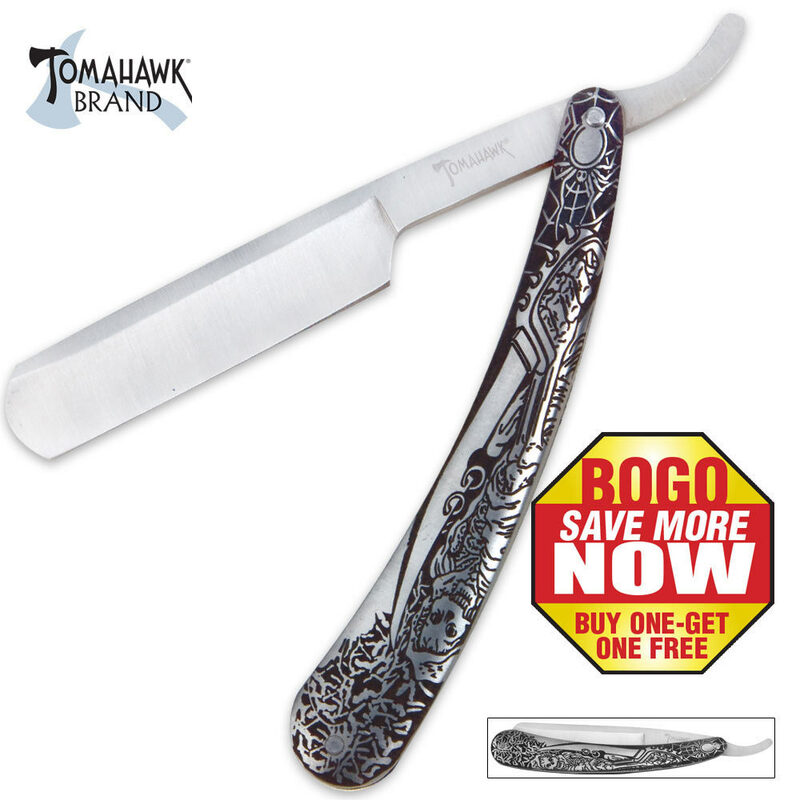 I gave this razor three stars (could be four) for it's rough looks and semi-sharp blade (still have to strop it). If you want these for cool looking knives, they are definitely that. However, if you honestly just want a close shave they are not for amateurs. The huge thick blades are very heavy and excessively long as a shaving instrument. One knife arrived dull and took an hour with a leather strop to sharpen. The other knife arrived sharp enough that I was able to shave with it fresh out of the box. Overall, well made, very impressive, but not for beginners.